First stage dementia (typically 3-6 years), often called Mild AD or early-stage, is marked my mild confusion and forgetfulness like repeating oneself with impaired ADLs like paying bills twice and forgetting to take medicines or neglect of personal hygiene. Second stage dementia (about 2-3 years), called Moderate AD or middle-stage, is marked by pronounced short-term memory deficits and confusion. ADL impairment often results in Assisted Living Facility (ALF) placement. 60% of people in 2nd stage dementia have psychiatric problems like paranoid delusions (someone is stealing my things) with some even showing hallucinations. Third stage dementia, is also called Severe AD or late-stage. Patients are often in nursing homes, or require full-time assistance and supervision. Vocabulary may be limited to six or fewer words and the patient may fail to recognize family. Mercifully, this stage lasts about 1 year or less, as these patients are targets for opportunistic infections like repeated UTIs or pneumonia. Suppose someone has a short-term memory problem, but no other cognitive deficits, and/or the problem is not significant enough to interfere with ADLs? They may meet criteria for MCI. If short-term memory was OK, but there was a language problem like a word-finding deficit and/or episodes of confusion, we would call this a non-amnestic MCI. There may be mood changes like irritability, too. Mild Cognitive Impairment - MayoClinic.com. 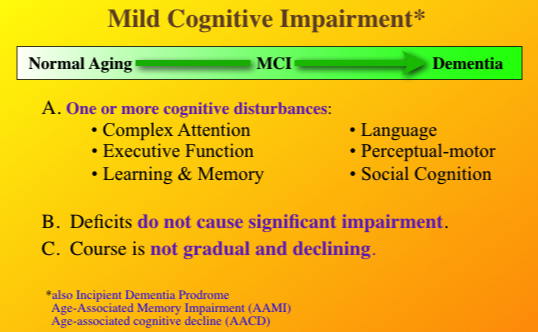 Also note that the technical diagnosis of MCI was changed in October of 2015 and is now called Mild Neurocognitive Disorder. For that matter, the diagnosis of Dementia was also changed to Major Neurocognitive Disorder. You will see most professionals still using the terms MCI and dementia as they are better understood by families, but don't be surprised if you see the new terms in our reports on your insurance bill.